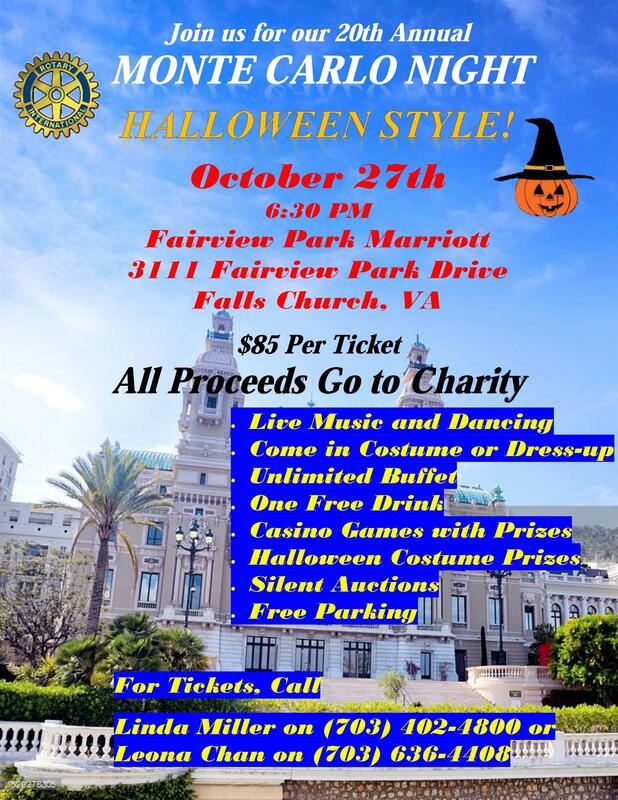 Its going to be here before you know it, so don't delay....click here to purchase your tickets to Rotary on the Vine! Don't miss this evening of fun, friends and (how can you go wrong.... ) GREAT WINE!!! Looking to make your evening even more worthwhile? Purchase a raffle ticket for your chance to win an elegant beach home stay on the outer banks! 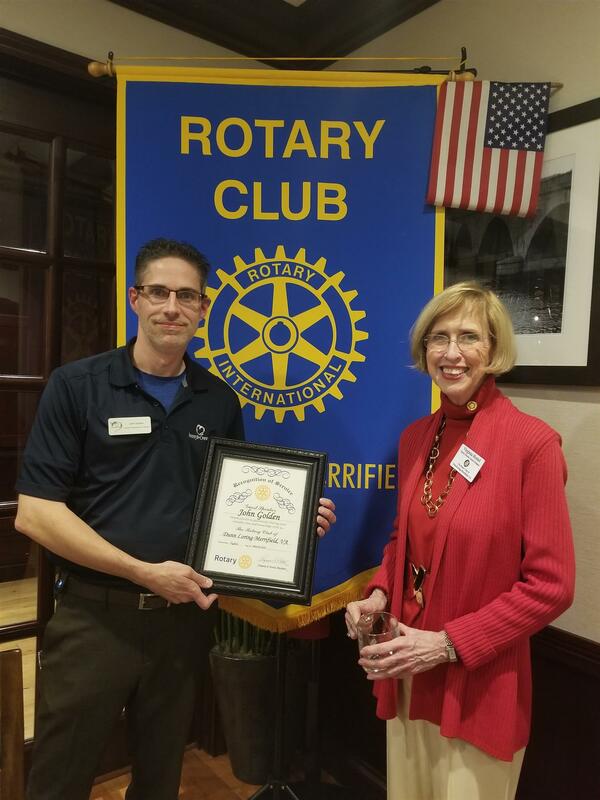 Our club welcomed John Golden, Director of Development & Outreach from Food for Others. Every day up to 90,000 people go hungry across Northern Virginia, one of the nation's wealthiest regions. Learn how Food For Others is helping. Bob Luckett founder of Veteran's Next Mission (VNM) spoke to our club about the work they are doing which helps veterans successfully transition from military service to civilian life by providing effective training for trades in the construction industry. 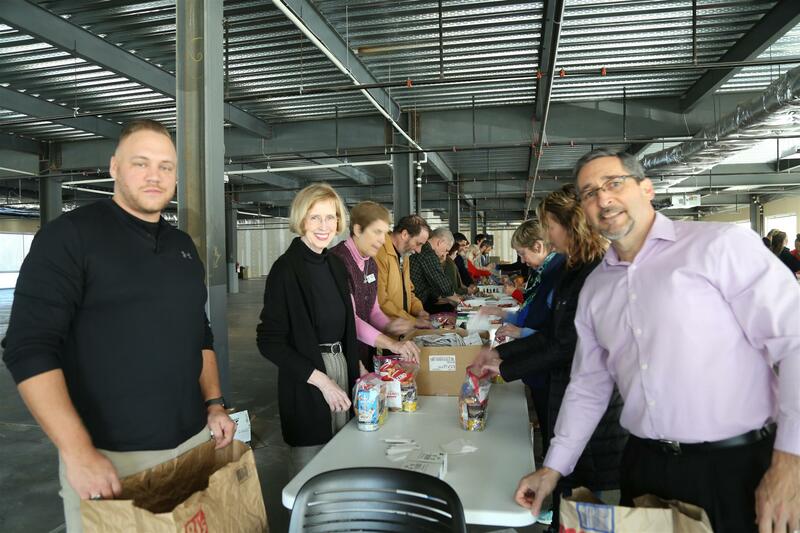 VNM is looking for donated warehouse space in Northern Virginia as well as an attorney that can provide pro bono legal services. Vadym Guliuk presented to our club about the many facets of his photography and aerial photo work. Specializing in Head Shots, Wedding, Commercial, Aerial (drone) & Video, Vadym's style is extraordinary. 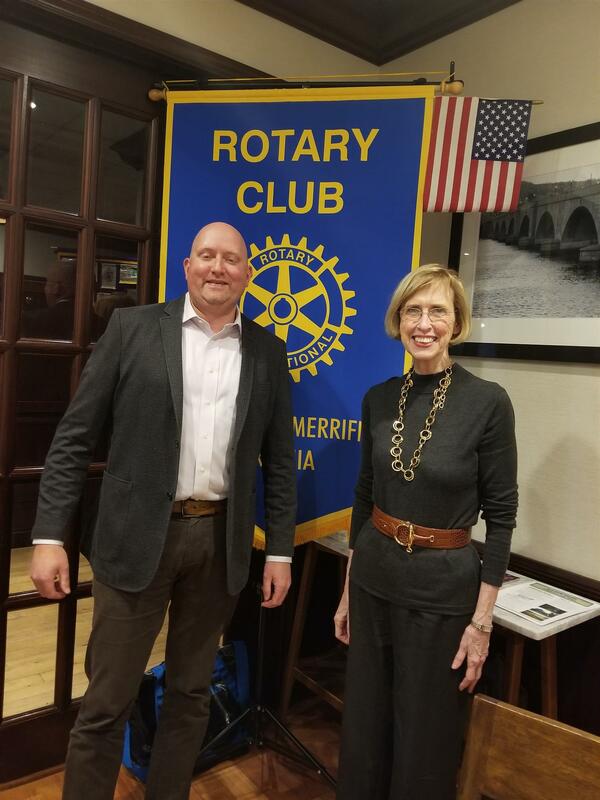 Our club welcomed Wayne Chiles, fellow Rotarian working with Shelter Box. Our club as well as Rotary International has a strong partnership with Shelter Box, which responds to disasters worldwide. 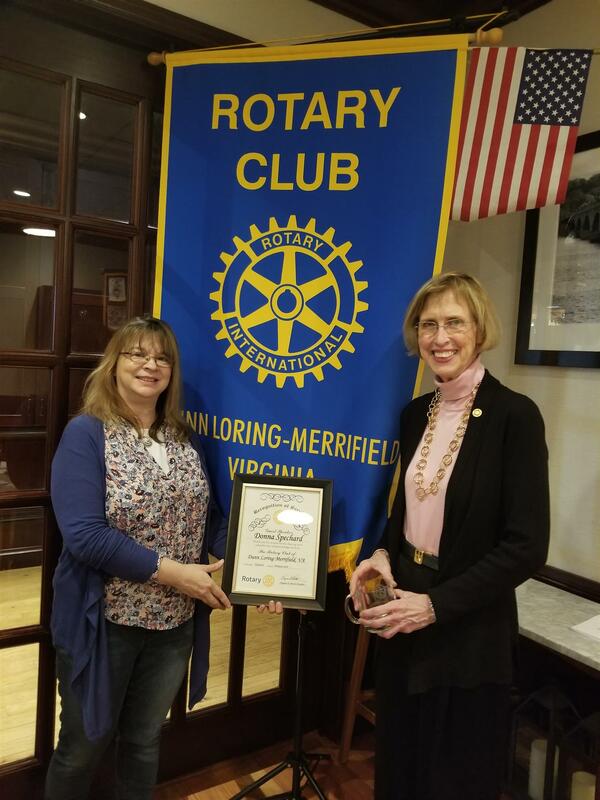 Susan McDougull Assistant Governor of District 7610 proudly announced our Dunn Loring Merrifield Rotary achieved 100% annual participation from members contributing to the Rotary Foundation. 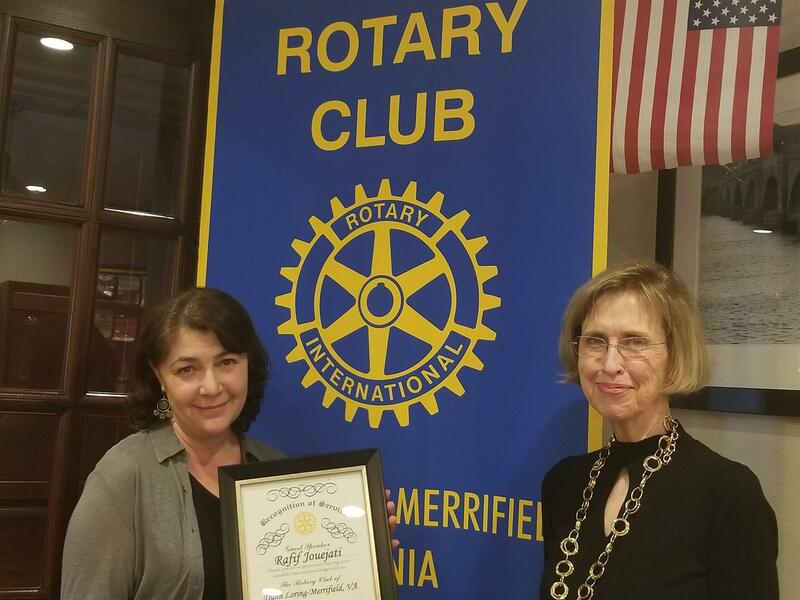 Donna Ivey, past President and current President Virginia Hottel accepted the awards. Briton Camphouse, Associate Director of Philanthropy at TNC & Jill Bieri, Director of the Virginia Coastal Reserve at TNC spoke to our club. The Nature Conservancy is a global non-profit that works to preserve and protect the land and waters in which all life depends. TNC spans all fifty states and seventy-two countries..In Virginia, TNC has protected over 346,000 acres spanning from the coast of the Atlantic to the Clinch River Valley in the Cumberland Highlands. families to create a safer community. 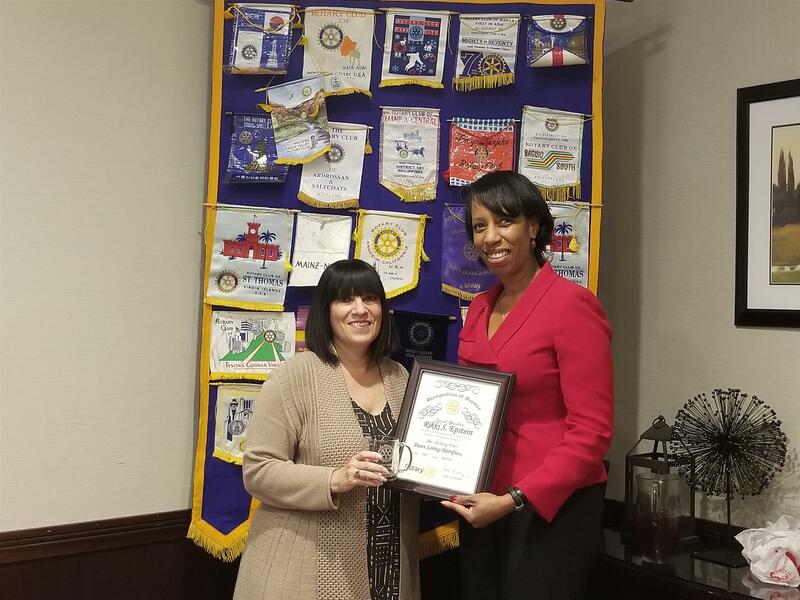 Britepaths Director of Development D'Ivonne Holman spoke to our club sharing the mission of Britepaths (Formerly Our Daily Bread). 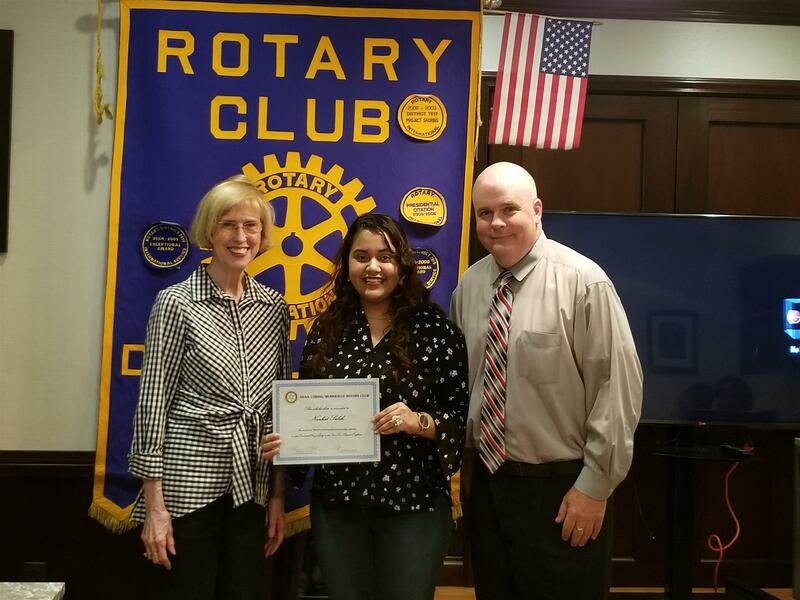 Bob Landon, Assistant Administrator for Fairfax County Adult High School, along with club President Virginia Hottel, presented Nuzhat Saleh with our 2018 scholarship award. 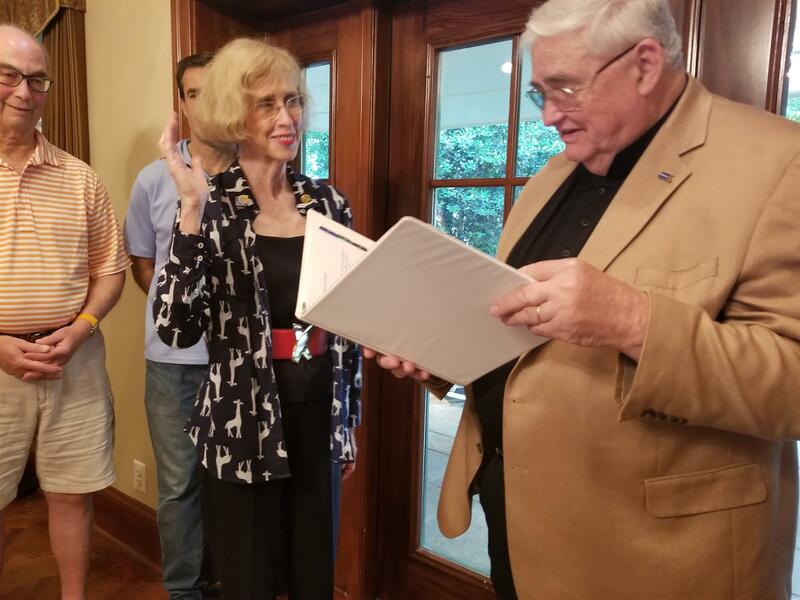 Virginia Hottel - New President, who has served for her 3rd term was inducted by District Governor - Glenn Yarborough. 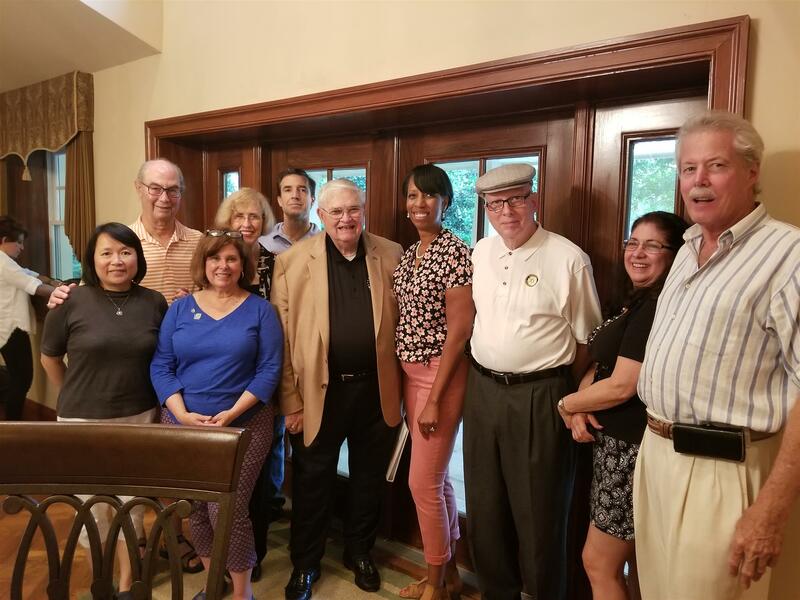 Ed Hogg (DLM Rotary) attended the fundraiser to benefit the important work of the Assistance League of Northern Virginia. 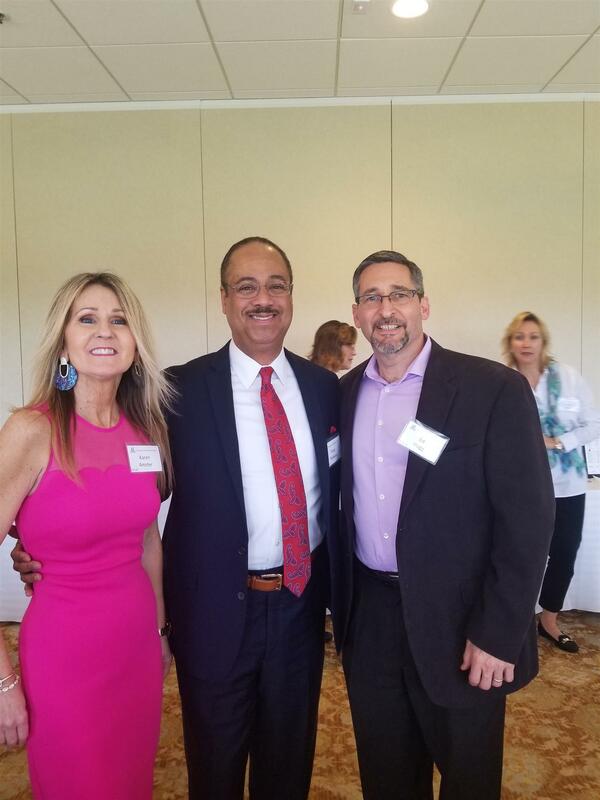 Thanks go to Karen Amster - VP Resource Development for hosting a GREAT Annual Spring Fundraiser with Keynote Speaker - Tony Perkins - Anchor FOX 5 News. Donations will continue for many local children services like Operation School Bell, Operation Hugs & Elementary School Food Packing that benefits more than 6000 underprivileged children in our community. Another successful food packing event for needy elementary school children in Northern VA! XXII Annual Northern Virginia Golf Classic! On December 8, DLMR club members gathered at the home of Diane and Alan Chase for our annual holiday party and operation Adopt-a-Family Santa workshop! Rotarians and their families wrapped more than more than 50 gifts for three needy families in Fairfax County! The family's social workers were thrilled when we delivered our sleigh-load! We are so fortunate to enjoy the great company of caring Rotarians who find the best part of the Christmas season an opportunity to give back to our community! 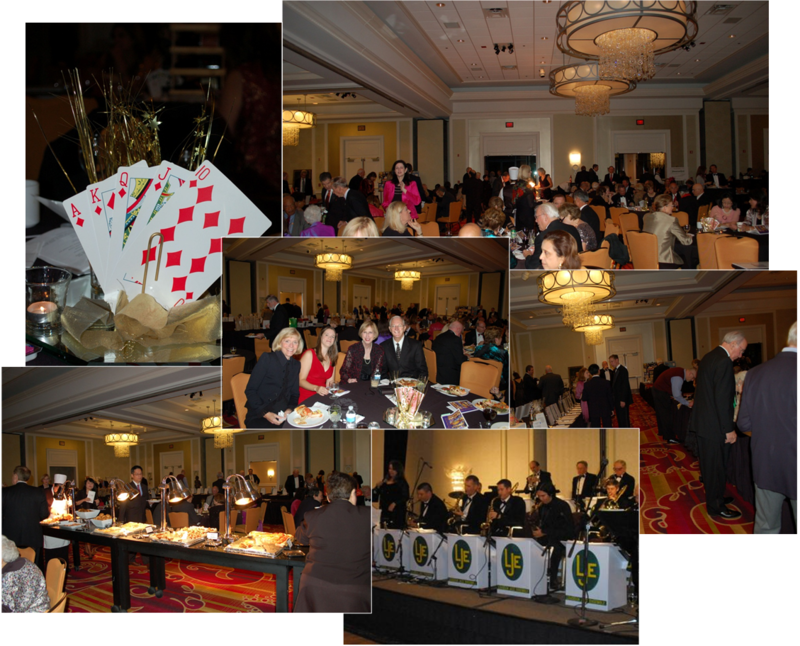 Did You Miss the 2017 Monte Carlo Night? If you missed it you missed a great time! All proceeds will be going to charities throughout next year! Come to one of the sponsoring Rotary Club meetings - Watch the magic happen!!! The DunnLoring-Merrifield Rotary now meets at the Tysons Corner Marriott, at 12:30 PM! See you at club meetings on the first, second and third Fridays of the month at the Marriott. Check the website for locations of our fourth week Tuesday evening social and for changes in meeting venue. The club mourns the passing of William A. Shand, long-standing club member and committed Rotarian. Bill was Club President from 2002-2003. Members attended a memorial service in celebration of his life on July 29, 2017. Friends and family shared many memories of the contributions Bill made as a dedicated and successful family man, business man and humanitarian. The members of DunnLoring-Merrifield shared our appreciation of his contribution to the early success of the club! While we will miss Bill...his legacy lives on through his family and many community contributions. The made a memorial contribution to the Rotary Foundation in his name. Some people socialize at their favorite watering hole, DunnLoring-Merrifield Rotary hangs out at George Mason University! On a rainy Tuesday evening on April 25, 2017 members of the Rotary toured the new CHHS academic building scheduled to open in December 2017. We were amazed and impressed at THE latest in higher education design! 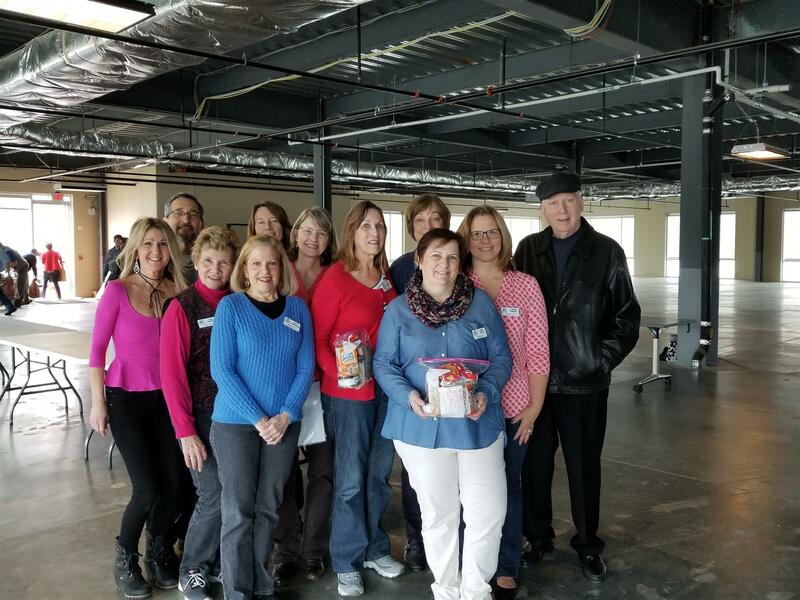 DunnLoring-Merrifield Rotarians made Irish Stew for the 25th Project's monthly effort to feed the homeless in Prince William County. 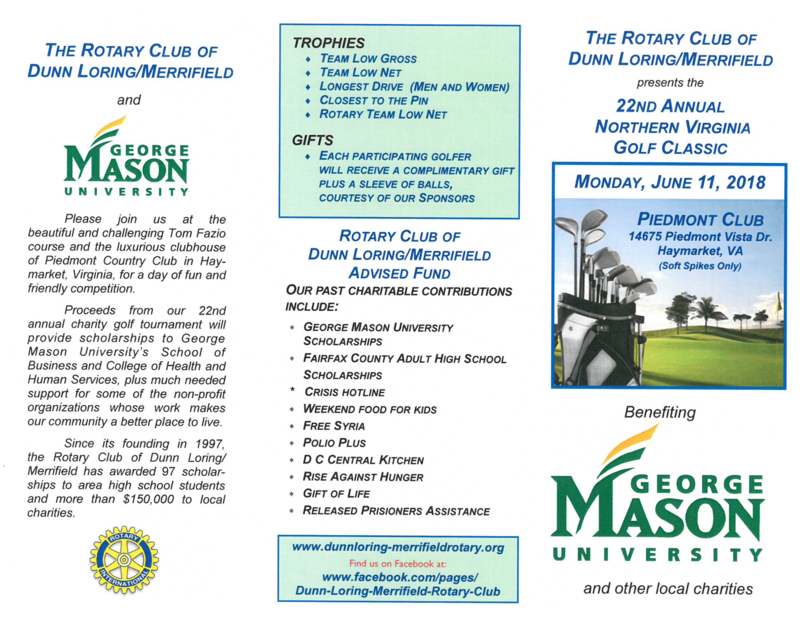 The 21st Annual DunnLoring-Merrifield Golf Classic will be held on Monday June 12, 2017 at the Piedmont Golf and Country Club. Registration is now open! 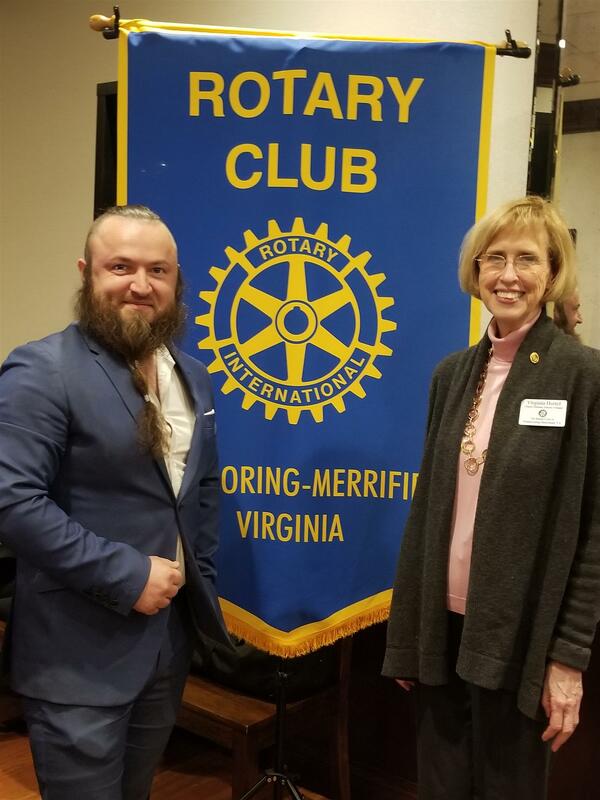 The Rotary Club of DunnLoring-Merrifield to join the 25th Project in serving Irish Stew to N. Virginia Homeless on March 25th! We cook on the 24th, deliver, serve and eat on the 25th!!!! The 25th Project is a non-profit organization dedicated to helping the homeless restore their name. We believe that doing One Thing, One Day, One Time (#OTODOT) can make a difference. Our current focus is helping a community of unsheltered homeless in the woods of Northern Virginia by volunteering on the 25th of each month. Rotary International is the world's oldest service organization with 1.2 million members in more than 34,000 clubs in over 200 countries around the world. The advancement of international understanding, goodwill, and peace through a world fellowship of business and professional persons united in the ideal of service. 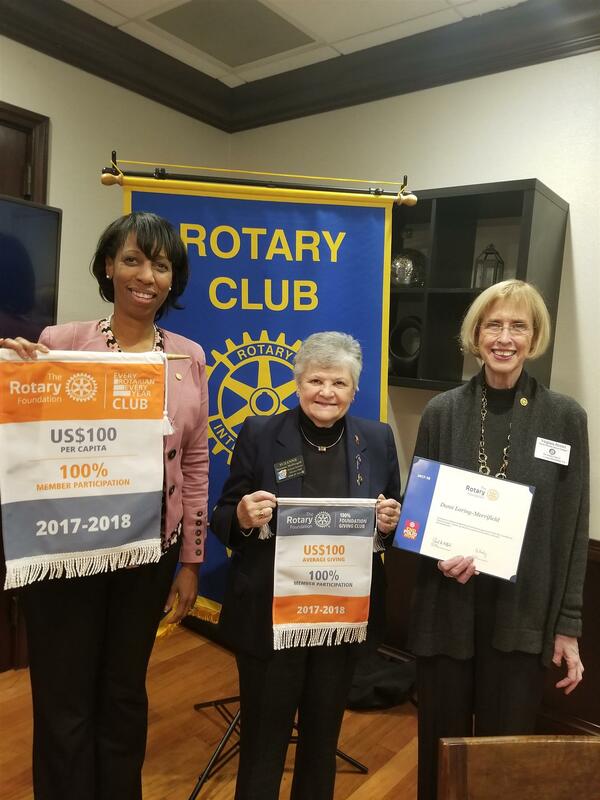 Our Rotary club and those in our district and across the globe are using our time, talent and resources to make possible community service and development projects, education and scholarship programs, international projects focused on improving water, literacy, health, hunger relief, economic development and peace-making. Rotary's best known projects include disaster relief, polio eradication, Youth Exchanges, University Peace Centers and ambassadorial scholarships! Dunn Loring-Merrifield Rotary's local service projects include scholarships for Fairfax County Adult High School students attending N. Virginia Community College, George Mason University students in the School of Management and the College of Health and Human Services, Assistance League backpack meals for hungry school children, Stop-Hunger Now events, improving facilities for the VFW and projects that benefit Veterans, Alternative House, HomeStretch and more. Our international service projects have benefited projects such as Haiti relief efforts, ShelterBox, water projects and international schools. Are you interested in making business contacts, serving your community and making new friends? 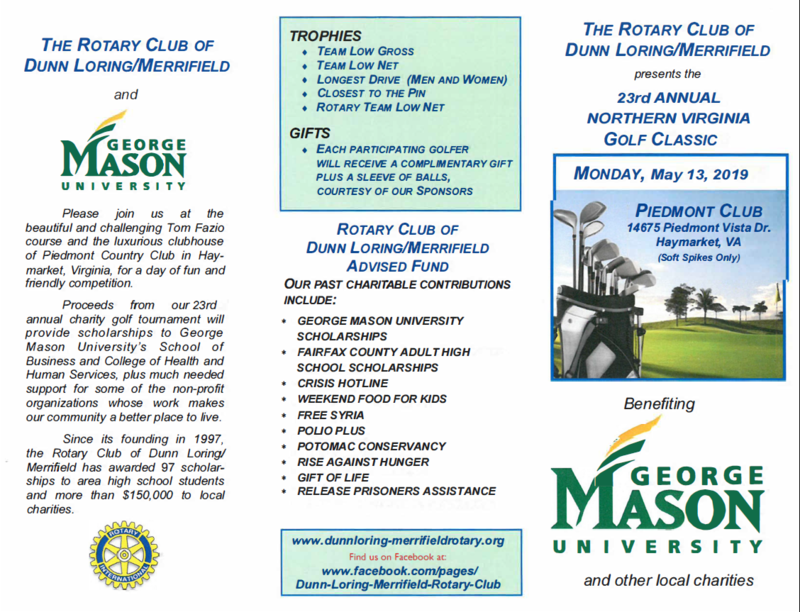 Tour the club website and visit our Facebook page to learn more about Dunn Loring-Merrifield Rotary! Most importantly, make time to join us for lunch soon! 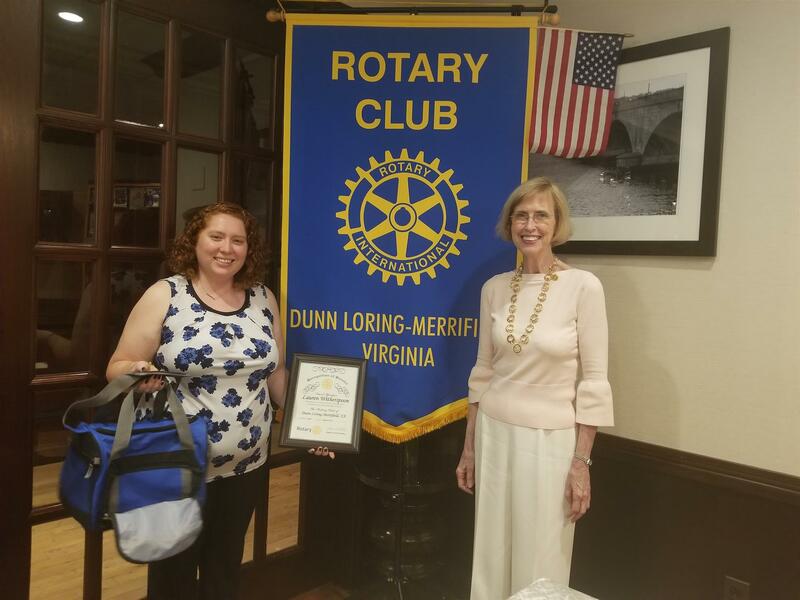 Dunn Loring Merrifield Rotary.. doing our part to 'Be a Gift to the World' one community project at a time! The Fourth Week We Party! On the fourth week of the each month we met at Ruth's Chris Steakhouse in Tyson's Corner, Virginia for a member and guest social hour. This substitutes for the regular club meeting that would otherwise take place that week (week of the fourth Friday). Join us at Ruth's Chris: 8521 Leesburg Pike, Vienna, 22182! Holiday Party and Service Project a Smashing Success! The DunnLoring-Merrifield Rotary Club's annual holiday celebration featured the 'best in ugly' holiday sweaters and an evening of gift wrapping frenzy for our Adopted for Christmas family! 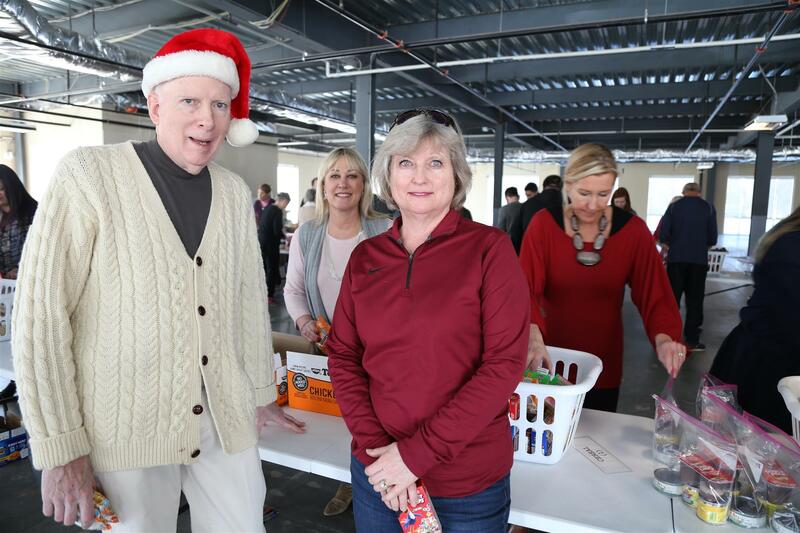 Check out the photos of our holiday fun and the club's generous spirit of caring about those less fortunate! Was Way Fun... All Proceeds are going to Charities! Rotary’s founder, Paul Harris, believed that serving humanity is “the most worthwhile thing a person can do,” RI President-elect John F. Germ said, and that being a part of Rotary is a “great opportunity” to make that happen. 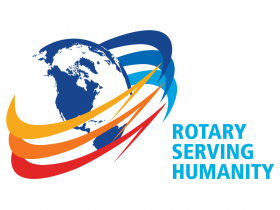 Germ unveiled the 2016-17 presidential theme, Rotary Serving Humanity, to incoming district governors on 18 January at the International Assembly in San Diego, California, USA. “I believe everyone recognizes the opportunity to serve Rotary for what it truly is: not a small opportunity, but a great one; an opportunity of a lifetime to change the world for the better, forever through Rotary’s service to humanity,” said Germ. Rotary members around the globe are serving humanity by providing clean water to underdeveloped communities, promoting peace in conflict areas, and strengthening communities through basic education and literacy. But none more important than our work to eradicate polio worldwide, he said. After a historic year in which transmission of the wild poliovirus was stopped in Nigeria and all of Africa, Germ said we are closer than ever to ending polio. The Twentieth Annual Golf Tournament was Memorable! Leona Chan and Linda Miller (co-Chairs) of the multi-club Monte Carlo fundraiser are hard at work to make this year's event more successful than the last! While we enjoy the benefits of freedom, countless men and women are serving in our armed forces in remote locations around the globe. These brave men and women have chosen to serve our country; many of them are away from home, in harm’s way and living each day with very few modern comforts. 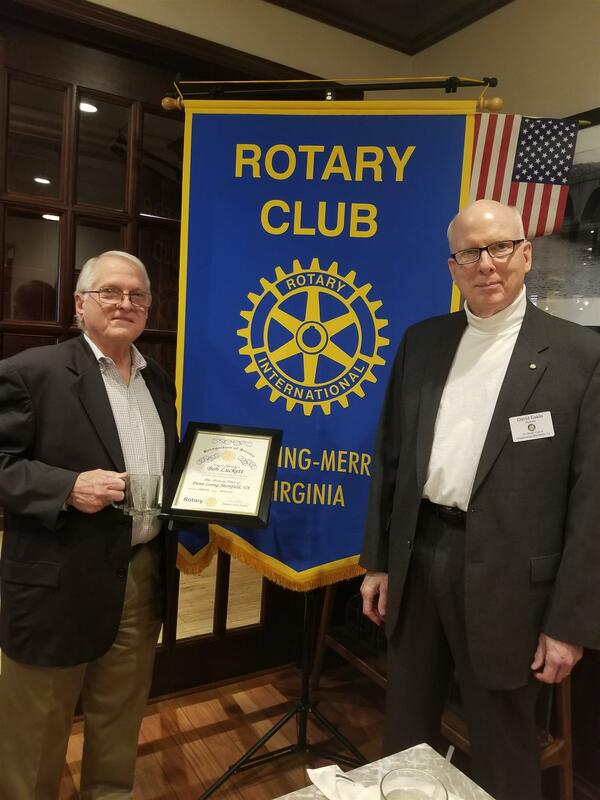 The members of DunnLoring-Merrifield Rotary appreciate the service of self-sacrifice of our military, especially those serving aboard ships and deployed to distant countries. It is our club’s privilege to know a very fine navy officer who is deployed far from home. To express our appreciation we have set up Operation Treats for Troop: A monthly care package to bring a little bit of home to our dear friend Chris and his buddies! Thanks Chris and company for your service and dedication!!!! We hope you enjoy our personal selection of snacks, notes and memorabilia from home! Until we see you back home in Virginia…our care packages will be coming your way, filled with love and appreciation for all you do! With spectacular weather, amidst peak cherry tree blooms, members of DunnLoring-Merrifield Rotary took part in the annual Make a Wish Foundation 3 mile 'Walk for Wishes' on Sunday April 12, 2015. We had great fun and great weather while raising money for a really great cause AND we burned a few calories along the way! Check-out the full story on the club Facebook page....don't miss the photos of David and Ed with Redskin cheerleaders! The Mtilizisa Suspension Bridge was inaugurated this past June. It was the first suspension bridge done in Zambia. The matching grant by “Bridges to Prosperity” was for two bridges in Zambia...both of which now have our club’s name as a sponsor, with one dedicated to Richard Madlener. The club wanted to dedicate this bridge to Richard, who was a founding member of our club. He passed away during the 2012-2013 Rotary year. Since Richard was a strong supporter of the Bridges to Prosperity program, our club felt it appropriate to have a bridge named after him. 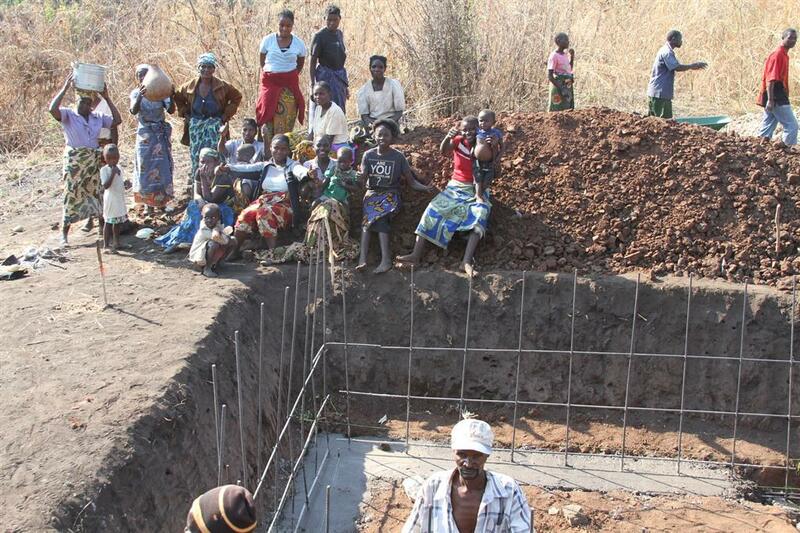 The Kachenjais section is a collection of subsistence farming families living outside the village of Mtilizisa. During the rainy season, the Mtilizisa river becomes impassable, cutting the population off from the rural clinic in the village and from being able to travel on to the district capital in Nyimba, where major markets and government services are located. Title 1 schools have free or subsidized lunches during the school year, but what about the weekends? 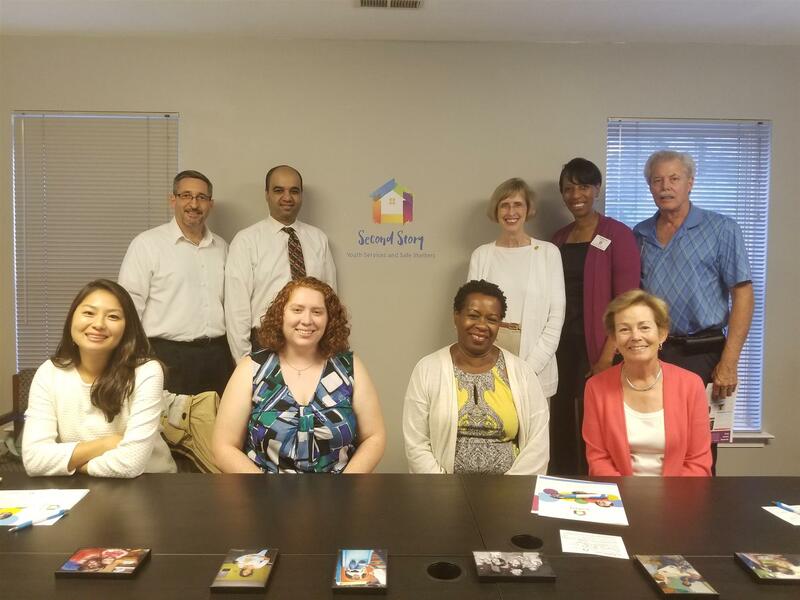 Working through the Assistance League, we help sponsor their Weekend Food for Kids program that offers packaged food for weekend use, helping insure that at-risk kids are able to study during the weekend and to come to school ready to learn. Our club plans on contributing $4,000 this year, and would like to do more. We also help with the food packing effort that takes place each month of the school year. How would you feel if you were a parent in a third world country and your child was going to die for the need of an open-heart operation? How would you feel if people from another country that you never met, offered to transport your child and family to the United States to receive the life-saving surgery? All at no expense to you - enabling you to return to your country with the joy of a new year filled with life’s opportunities. The Gift of Life program, created within Rotary, is now a stand-alone charity, one that our club supports annually. To-date our one club has saved the lives of four children, and looking for this year to save the fifth. Come help us make the magic happen. The premise of Rotary, founded almost 110 years ago, is that people can come together in fellowship and service to solve community and even international problems. We work to improve the quality and dignity of life through projects that impact health, education, and vocational support. If you have ever felt like you wanted to make a difference, to be part of the "THEY" that people speak of when defining the empowered, then perhaps Rotary is for you. No more will you see, read about, or hear of something wrong in the world, and wonder why don't "THEY" do something. The problems we face are many. The THEY can't be a small group. Rotary has grown to be over a 1.2 million people, involving more than 33,000 clubs world-wide. 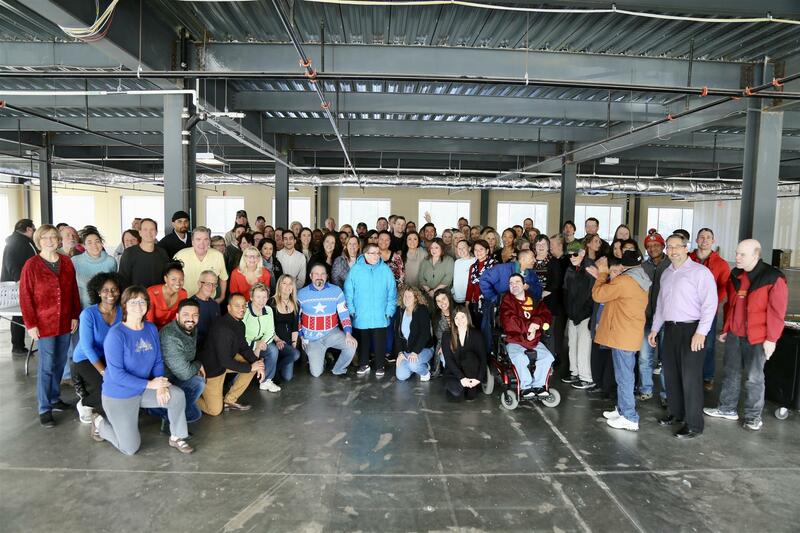 Together we are solving problems, not one at a time, but thousands at a time. But you have only to read a newspaper to know that there is still so much that needs to be done. 42 children benefited from the event with new school clothing. Our International Service projects include supporting “Bridges to Prosperity,” “Gift of Life,” Water Projects in Zambia, “Arlington Academy of Hope (Uganda Clinic Supplies),” Rotary’s “Polio Plus,” Jamaican Education Support projects, Haiti Medical Supplies, “Stop Hunger Now,” and “Free Syria” Humanitarian Aid. Perhaps our club’s signature source of funding support is providing college scholarships to deserving students in Fairfax County’s Adult High School (formerly focused to Pimmit Hills High School): Over the past decade our club has offered over 80 student scholarships. The theme of scholarship support has also been extended to include George Mason University’s College of Health & Human Services, and their School of Business, helping needy students achieve their educational goals. How do we select the projects we support? Opportunities are made known to our club by guest speakers, news events, our own club members, and recommendations by other Rotarians. If you have a charity of interest, or a special event that serves the community, consider becoming a speaker or a member of our club. Our program chair this year is Ms. Virginia Hottel, who can be reached by e-mail at wwdg@aol.com or by telephone at (703) 734-9770. Our membership chair this year is Mr. Ed Hogg, whose e-mail address is ehogg9@gmail.com, and can also be contacted by telephone at (703) 862-8168. Some of the projects we have supported in the past are described in the follow-on stories. Proposing a new member is very easy. The process is described in the "View Club Documents" section of "My ClubRunner." Just access "Proposing a New Member" in the documents listing. The document not only explains the process, but lays-out the information needed about the new member. Communication is also needed with a prospective new member to inform them of what we have done, but more importantly, to ask them what they want our club to do for them. 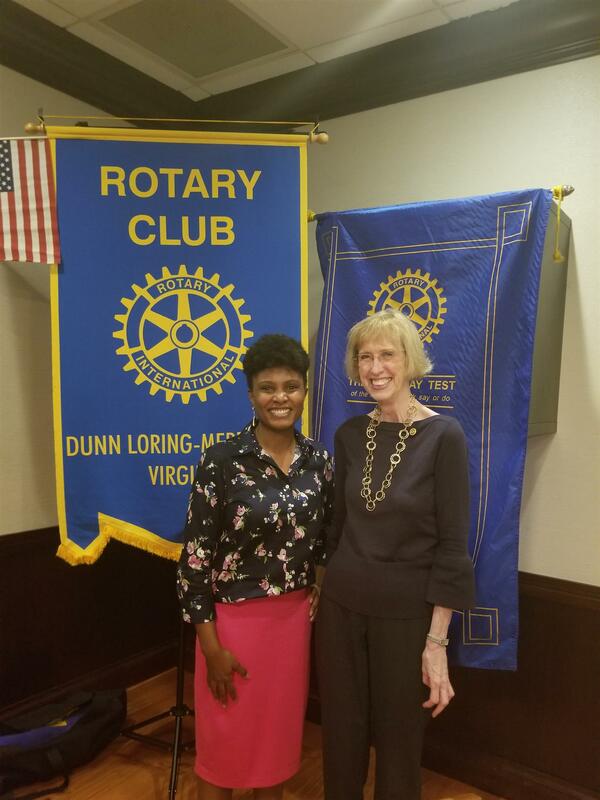 Every year, the Rotary Club of Dunn Loring-Merrifield offers college scholarships to deserving adult high-school students of Fairfax County, Virginia. Amounts can range from hundreds to thousands of dollars. This past year, two students (Benjamin Lane, and Ivy Crosier) received scholarships, totaling $6,500. Through the years, more than $80,000 has been provided to almost 70 students, often enough to pay tuition for a full year at NOVA. The selection process is rigorous, involving detailed applications and interviews – reviewed by school counselors, teachers, Fairfax County Adult High Schools administrator’s staff, and our Club’s Scholarship Committee. 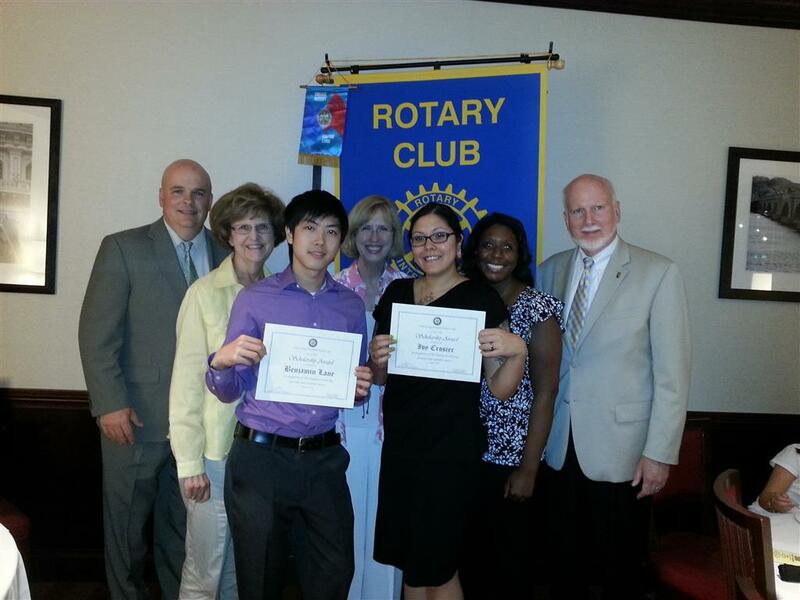 Shown in the photograph above (from left to right) is Robert Landon (Assistant Administrator of Fairfax County Adult High School, Jeannette Nelson (School Counselor), Benjamin Lane (Scholarship Recipient), Virginia Hottel (Club Scholarship Chair), Ivy Crosier (Scholarship Recipient), Nicole Low (School Counselor), and David Eakin (Club President). 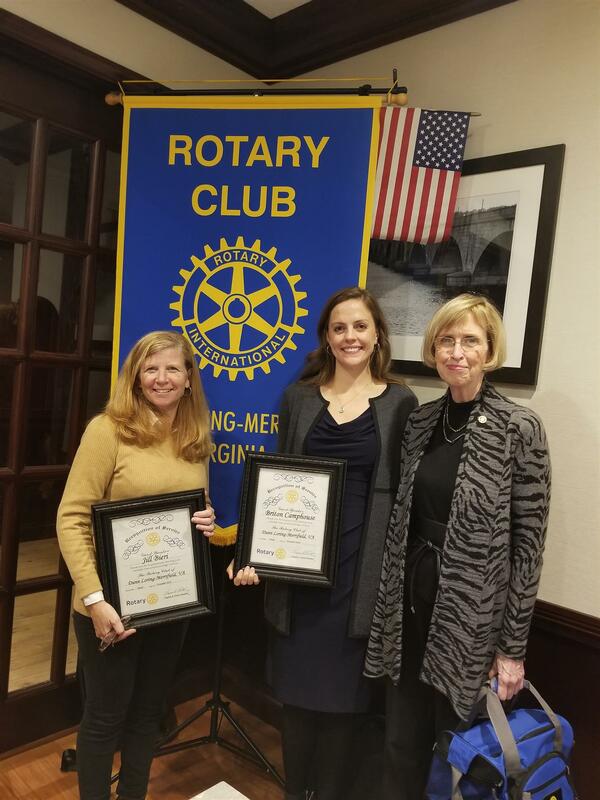 We coordinate our efforts with other Rotary Clubs (McLean and Tysons), and the Apple Federal Credit Union, who also have provided scholarships to Fairfax County Adult High School students. For more information about our scholarship program, contact Virginia Hottel on wwdg@aol.com. Our club has prepared a Strategic Plan, a Planning Guide, and budgets for the year - all available to members by logging-on to the members portion of this website, and accessing the "View Club Documents" menu item. The Strategic Plan is intended to be a 5-Year profile of general Goals and Action Items, while the Planning Guide treats specific Annual Goals and Activities planned for this Rotary Year. Both documents treat the Club's objectives for membership growth, and support for the Rotary Foundation. The Budgets address "Administration," "Service Projects," and "Fundraising." Each represents Board Approved income and expense profiles for this year. With Board Approval, projects can be initiated without further Board action. Changes in Budget allocations must be further approved by the Board. Project # 091. The bridge will be the first newly designed suspension bridge to be built in Africa. Rain and other delays have delayed completion of the bridge until April or May 2012. The bridge is partially funded by Rotary Foundation.Humanatarian Grant 757444. The grant should be open for at least three months if members would like to make a Paul Harris eligeable donation to support the bridge construnction. This can be accomplished using the TRF Global Contribution Form which can be found under Downloads. We are thrilled about the wonderful feedback and support we have received from our Parade article published on March 7th. To keep our momentum going, we have just posted a fabulous new video on our website highlighting the work Rotary International has done in Ethiopia. We wanted to personally invite you to view the video. Sebra Dildey - Click Here to Watch Video! Thank you for all your continued support and we hope you are just as proud of this and we are. Harry Rauner thought that club members would be interested in a Talk Loudoun article that features: Ashburn Rotary Club, www.meetup.com/Rotary-Club-of-Ashburn/; Dulles International Airport Rotary, www.dullesairportrotary.org; Leesburg-Daybreak Rotary, www.leesburgdaybreak.org; The Rotary Club of Leesburg, www.leesburg-rotary.org; Purcellville Rotary, www.purcellvillerotary.org; or Sterling Rotary, www.sterlingrotary.org. It's great PR for Rotary and for these clubs. Click Here to see the article. Include The Rotary Foundation in your estate plans to forever be a part of Rotary's legacy of doing good in the world. Receive a special invitation to join the Bequest Society by contacting 847-866-3100 or plannedgiving@rotary.org. Thank you. The RI web site has an article on how Rotarians are responding to the disaster in Haiti. The web site for District 7620 has much current information. Rotary International provides training opportunities for all Rotarians. The Rotary E-Learning Center is your online resource for the independent study of Rotary, particularly for new members and club officers. Rotary International also produces training resources for a variety of training seminars held throughout the year for district leaders and for club leaders and members. Click on E-Learning Center and see what you can learn. You can also click the second link under Rotary Links in the upper left corner of the DLRC web page. Skip spoke to the club about monolithic dome construction, specifically his home near Charlottesville. The Monolithic Dome web site is packed with information and deserves a visit. Skip and Barbara Rosholdt live in a monolithic dome home near Charlottesville. Here's an article about their home. Jim Southworth, producer of The Inside Scoop and board member of Fairfax Public Access Channel 10, is a recognized expert on using TV combined with "new" media to reach and promote interaction on issues between community leaders and viewers. He told us how we can tap into this process to get out our (Club or personal) message to the audience we want to reach. He also presented a fascinating look at the advances in technology at Channel 10. Rotary is the ability to find out about specific community and international needs, and to prompt projects that meet those needs. Dunn Loring Rotary Club projects for the Rotary year 2009-2010 are presented under Site Pages. "For too long members of the community of La Hacienda de las Sabanas have been crossing the river on a thin cable to get to and from their farmland on the other side of the river. When the river floods, which it does for more than 6 months of every year, they cannot cross at all." To see a slide show and Google map location for the La Hacienda Suspended Bridge Dunn Loring helped to build click here. On April 21 the Dunn Loring Scholarship Committee awarded scholarships to six Pimmit Hill High School students in the amount of $4200. The recipients will be presented their scholarships by Conrad Heer at the Pimmit Hills graduation ceremony which will be held at Annandale High School at 7PM on June 17. The recipients will visit the club for lunch on May 14. On January 6 the Dunn Loring Scholarship Committee awarded scholarships to four Pimmit Hill High School students in the amount of $3500. The scholarship recipients are Nita Kumar, Abdi Mahamed, Moon Shin, and Jaime Monterroso. The recipients were presented their scholarships at the Pimmit Hills graduation ceremony which was held at Marshall High School on February 11. Gates Foundation Awards $100 Million! A Historic Day for Rotary - Gates Foundation Awards $100 Million! 2007-2008 PolioPlus Partners Challenge - Your Help is Needed! To see the details of the gift as well as a letter from RI President, Wilfrid Wilkinson click here. Founded in 2006 by a group of recent university graduates, Proyecto Villa Nueva (click here to see their informative web site) is a small U.S. based non-profit developing innovative approaches to youth leadership, information access, and health education in schools for the urban poor in Tegucigalpa, Honduras. A update & follow-on to the earlier presentation by board member Kendall Turner, Proyecto's director Mr. Walkinshaw of the World Bank will discuss the best practices model & its successes to be shared with national government & other education-focused NGOs. 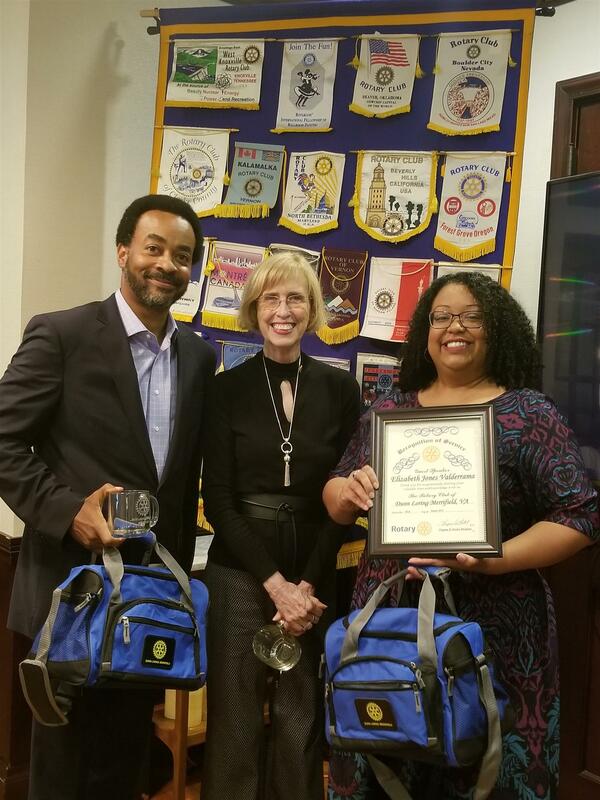 At the recent District 7610 Conference the Dunn Loring Rotary Club was awarded third place for its web site and second place among small clubs for its weekly eBulletin. The awards were presented to P.J. Maddox by ADG Horace McCormack at the club's weekly meeting on May 12. 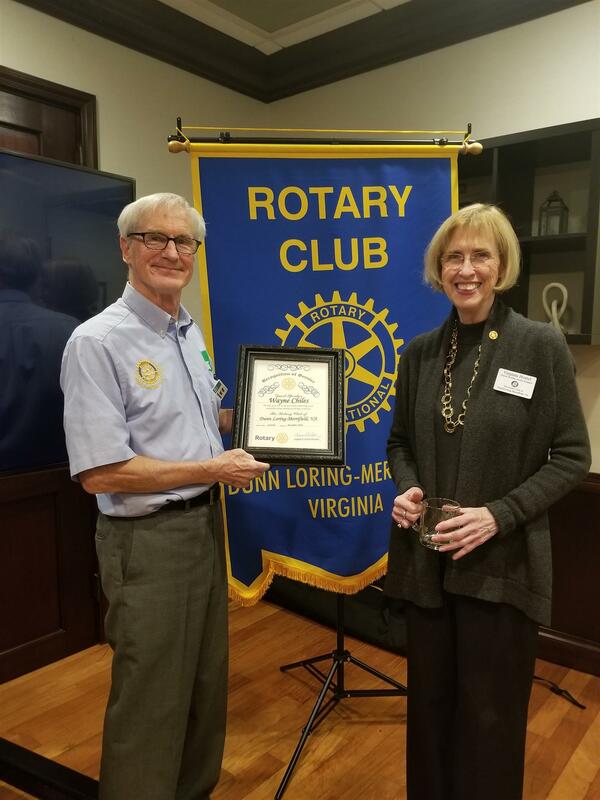 Dunn Loring Rotary Club won the Community Partnership Award for the work the club has done providing scholarship, volunteer, and financial support to Pimmit Hills High School. The award was presented to the club at the Partners in Education and MentorWorks Awards ceremony at Falls Church High School, May 25, 2006. Contributions to The Rotary Foundation (TRF) are eligible for Paul Harris Fellow Recognition. TRF Global Contribution Form can be downloaded from the Download section of the web page. You can easily donate to the Rotary Foundation Annual Fund online via the RI web page. Click on Member Access (upper right corner of the page). Register if you have not already registered or enter you user ID password. To register you enter district number: 7610, club number:50266, and your membership ID: it's the seven digit number following #0 on your Rotary Magazine mailing label. When you are in the Membership Access area click Contribute to the Rotary Foundation and contribute. Club members are urged to enter their own makeups.